Before I say a lot of very negative things about Anibal Sanchez, allow me just a moment of nostalgia and the chance to salute a Tigers pitcher who did some very cool things for the team. He helped the Tigers on their way to a division title in 2012 and 2013. He put up an ERA+ of 162 in 2013, which is tied for eighth-best seasonal high on the all-time franchise list. He owns the franchise record for most strikeouts in a single game. Which makes it so much harder to face the reality that he's been a problem since 2015, and as of this week, he just became an even bigger problem. Until Tuesday's announcement that Justin Wilson would be taking over the closer role, the Tigers had the worst ninth inning win percentage in baseball. (Tied with the Rangers, actually, but that's barely even a moral victory.) Francisco Rodriguez had spent five weeks compiling worse numbers than any reliever on the team not named Anibal Sanchez, and it was the right thing to remove him as the guy responsible for protecting slim leads in the last inning. But did you hear what I just said? K-Rod and Sanchez are the worst two relievers on the team, and among the worst relievers in all of baseball right now. ERA? What's the difference between 8.64 and 8.49? Home runs given up per nine innings? Let's not quibble over 3.2 versus 3.1, ok? How about preventing run scoring situations, as measured by RE24? A -10 and a -15 really aren't worth splitting hairs. Let's not even talk about baserunners allowed per inning and the non-difference between 2.10 and 2.06, because that's silly. So now the Tigers have two relievers that really shouldn't be coming into games unless the team is either winning by a blowout, or losing by a blowout. They are both, effectively, "long relievers" who should be doing mop-up duty, except that one of them isn't even a multi-innings pitcher. But if I had to guess which one of them will bounce back and still be useful this year, my money is on the veteran closer who doesn't have over 300 innings of evidence that someone covered in goop and set on fire. Anibal Sanchez is getting in the neighborhood of seventeen million dollars this season. That's more money than I'll see in several lifetimes, even if I somehow succeeded wildly and nailed down a six-figure job with every reincarnation. The point of realizing that fact is to acknowledge that it's awfully easy for me to say, "ahhh, release the bum and eat that money." Wow, was that easy to say. But it probably needs to happen now, because the Tigers are essentially running a four-man bullpen, and it will go up in flames if the same three or four guys are pitching most nights of the week. That bullpen needs another reliable arm, which means that Anibal Sanchez is taking up a valuable spot that is very much needed at the moment. This is one of those nonsensical economic oddities, like when toilet paper is on sale and you're already fully stocked, but if you don't go spend money right now that you weren't planning to spend this week, on a product you don't need right now but will in the future, somehow in the long run you're actually losing money. 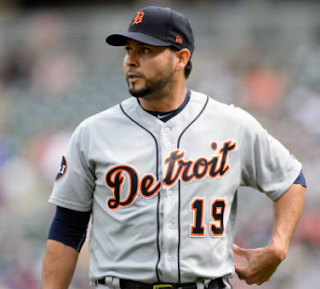 Anibal Sanchez costs millions, but keeping him on the team is actually driving his price tag up. This is the part where we have to talk about WAR. WAR stands for Wins Above Replacement. Basically, it's an attempt to take all of a player's individual key performance stats, toss them in a blender with some Margerita mix, and wind up with a single delicious glass of How Valuable is This Player. That value is measured in how many wins this player contributes above and beyond a random replacement player from Triple A or wherever. Generally, you'd prefer that your Major League Baseball players contribute more than zero, break-even WAR, otherwise you might as well just call up the next minor league substitute and pay him less money to do the same job. Oh, and by the way, the mad scientists who do all the number-crunching have estimated that +1 WAR is worth about eight million dollars, give or take. The Tigers aren't going to get very far with only four reliable arms in the bullpen, especially when one of those guys is perpetually used as a situational lefty to get one or two outs per game. At some point, you're either going to release Sanchez and replace him with -- I don't know, take your pick -- Warwick Saupold, Buck Farmer, Drew VerHagen, etc., or you're going to be forced to use Sanchez in a live game situation where you'd rather not. I wish Anibal Sanchez could have turned things around. But it's been more than two full seasons, and he seems like he's actually getting worse. And with a soon-to-be overworked bullpen, it's probably time to cut him loose.